Location of Shumshu in the Kuril Islands. The Battle of Shumshu, the Soviet invasion of Shumshu in the Kuril Islands, was the first stage of the Soviet invasion of the Kuril Islands in August–September 1945 during World War II. It took place from 18 to 23 August 1945, and was the only major battle of the Soviet campaign in the Kuril Islands and one of the last battles of the war. 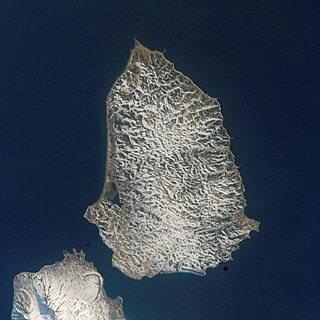 Shumshu is the second-northernmost island of the Kuril Islands chain, which divides the Sea of Okhotsk from the northwest Pacific Ocean. The name of the island is derived from the Ainu language, meaning "good island". It is separated from Paramushir by the very narrow Second Kuril Strait in the northeast 2.5 kilometres (1.6 mi), and its northern tip is 11 kilometres (6.8 mi), from Cape Lopatka at the southern tip of the Kamchatka Peninsula. The island has a seasonal population of around 100 inhabitants. The Kuril Islands or Kurile Islands, in Russia's Sakhalin Oblast region, form a volcanic archipelago that stretches approximately 1,300 km (810 mi) northeast from Hokkaido, Japan, to Kamchatka, Russia, separating the Sea of Okhotsk from the north Pacific Ocean. There are 56 islands and many minor rocks. It consists of Greater Kuril Chain and Lesser Kuril Chain. The total land area is 10,503.2 square kilometres (4,055.3 sq mi) and the total population is 19,434. The Invasion of the Kuril Islands was the World War II Soviet military operation to capture the Kuril Islands from Japan in 1945. The invasion was part of the Manchurian Strategic Offensive Operation, and was decided on when plans to land on Hokkaido were abandoned. The successful military operations of the Red Army at Mudanjiang and during the Invasion of South Sakhalin created the necessary prerequisites for invasion of the Kuril Islands. The Soviet–Japanese Neutrality Pact, also known as the Japanese–Soviet Non-aggression Pact, was a neutrality pact between the Soviet Union and Japan signed on April 13, 1941, two years after the brief Soviet–Japanese Border War. The pact was signed to ensure the neutrality between the Soviet Union and Japan during World War II, in which both countries participated. The Soviet–Japanese War was a military conflict within World War II beginning soon after midnight on August 9, 1945, with the Soviet invasion of the Japanese puppet state of Manchukuo. The Soviets and Mongolians terminated Japanese control of Manchukuo, Mengjiang, northern Korea, Karafuto, and the Chishima Islands. The defeat of Japan's Kwantung Army helped in the Japanese surrender and the termination of World War II. The Soviet entry into the war was a significant factor in the Japanese government's decision to surrender unconditionally, as it made apparent the Soviet Union would no longer be willing to act as a third party in negotiating an end to hostilities on conditional terms. Terms such as Northeast Asia, North East Asia, or Northeastern Asia refer to a subregion of Asia: the northeastern landmass and islands, bordering the Pacific Ocean. It includes the core countries of East Asia. Marshal of the Soviet Union was the highest military rank of the Soviet Union. 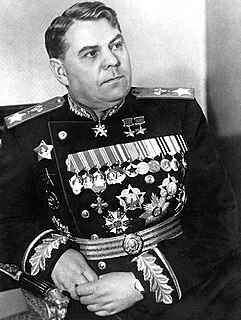 Aleksandr Mikhaylovich Vasilevsky, a Russian career-officer in the Red Army, attained the rank of Marshal of the Soviet Union in 1943. He served as the Chief of the General Staff of the Soviet Armed Forces and Deputy Minister of Defense during World War II, and as Minister of Defense from 1949 to 1953. As the Chief of the General Staff from 1942 to 1945, Vasilevsky was responsible for planning and coordinating almost all decisive Soviet offensives in World War II, from the Stalingrad counteroffensive to the assaults on East Prussia, Königsberg and Manchuria. The Soviet Army is the name given to the main land-based branch of the Soviet Armed Forces between February 1946 and December 1991, when it was replaced with the Russian Ground Forces, although it was not fully abolished until 25 December 1993. 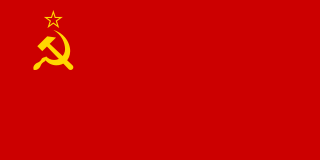 Until 25 February 1946, it was known as the Red Army, established by decree on 15 (28) January 1918 "to protect the population, territorial integrity and civil liberties in the territory of the Soviet state." 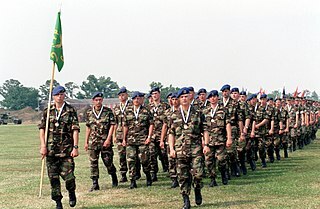 The Strategic Missile Troops, Air Defense Forces and Air Forces were part of the Soviet Army in addition to the Ground Forces. Petropavlovsk-Kamchatsky is a city and the administrative, industrial, scientific, and cultural center of Kamchatka Krai, Russia. Population: 179,780 (2010 Census); 198,028 (2002 Census); 268,747 (1989 Census). 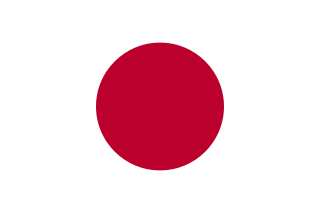 The 91st Division was an infantry division in the Imperial Japanese Army. Its call sign was the Future Division. It was created 12 April 1944 in Paramushir. The nucleus for the formation was the 1st Kuril Islands Garrison Group. It was an oversized type C(hei) security division, with its constituent brigades consisting of six infantry battalions each from July 1944. Highly unusually, the division had two artillery regiments. A tank is an armoured fighting vehicle designed for front-line combat, with heavy firepower, strong armour, tracks and a powerful engine providing good battlefield maneuverability. 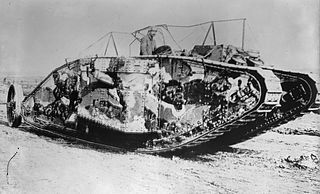 The first tanks were designed to overcome the deadlock of trench warfare in the 1916s; they are a mainstay of modern ground forces and a key part of combined arms combat. Modern tanks are versatile mobile land weapon system platforms, mounting a large-calibre cannon in a rotating gun turret, supplemented by mounted machine guns or other weapons, such as ATGMs, or rockets. They combine this with heavy vehicle armour which provides protection for the crew, the vehicle's weapons, and its propulsion systems, and operational mobility, due to its use of tracks rather than wheels, which allows the tank to move over rugged terrain and adverse conditions such as mud, and be positioned on the battlefield in advantageous locations. These features enable the tank to perform well in a variety of intense combat situations, simultaneously both offensively with fire from their powerful tank gun, and defensively due to their near invulnerability to common firearms and good resistance to heavier weapons, all while maintaining the mobility needed to exploit changing tactical situations. Fully integrating tanks into modern military forces spawned a new era of combat, armoured warfare. ↑ "Kurile Operation" Retrieved 6 April 2018. 1 2 3 4 5 Russell, Richard A., Project Hula: Secret Soviet-American Cooperation in the War Against Japan, Washington, D.C.: Naval Historical Center, 1997, ISBN 0-945274-35-1, pp. 30–31. ↑ Russell, Richard A., Project Hula: Secret Soviet-American Cooperation in the War Against Japan, Washington, D.C.: Naval Historical Center, 1997, ISBN 0-945274-35-1, pp. 3–4. ↑ Russell, Richard A., Project Hula: Secret Soviet-American Cooperation in the War Against Japan, Washington, D.C.: Naval Historical Center, 1997, ISBN 0-945274-35-1, pp. 4–8. 1 2 Russell, Richard A., Project Hula: Secret Soviet-American Cooperation in the War Against Japan, Washington, D.C.: Naval Historical Center, 1997, ISBN 0-945274-35-1, p. 8. ↑ Code-Name Downfall: The Secret Plan to Invade Japan-And Why Truman Dropped the Bomb. Simon & Schuster. pp. 155–162. 1 2 3 Russell, Richard A., Project Hula: Secret Soviet-American Cooperation in the War Against Japan, Washington, D.C.: Naval Historical Center, 1997, ISBN 0-945274-35-1, pp. 29–33. 1 2 3 Russell, Richard A., Project Hula: Secret Soviet-American Cooperation in the War Against Japan, Washington, D.C.: Naval Historical Center, 1997, ISBN 0-945274-35-1, p. 30. ↑ Russell, Richard A., Project Hula: Secret Soviet-American Cooperation in the War Against Japan, Washington, D.C.: Naval Historical Center, 1997, ISBN 0-945274-35-1, p. 19. 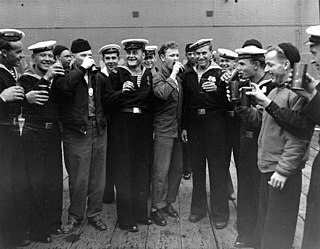 1 2 3 4 5 Russell, Richard A., Project Hula: Secret Soviet-American Cooperation in the War Against Japan, Washington, D.C.: Naval Historical Center, 1997, ISBN 0-945274-35-1, p. 31. ↑ Russell, Richard A., Project Hula: Secret Soviet-American Cooperation in the War Against Japan, Washington, D.C.: Naval Historical Center, 1997, ISBN 0-945274-35-1, p. 32. ↑ Code-Name Downfall: The Secret Plan to Invade Japan-And Why Truman Dropped the Bomb. Simon & Schuster. pp. 115–122. ↑ Russell, Richard A., Project Hula: Secret Soviet-American Cooperation in the War Against Japan, Washington, D.C.: Naval Historical Center, 1997, ISBN 0-945274-35-1, pp. 33, 34. USS Coronado (PG-146/PF-38), a Tacoma-class frigate, was the first ship of the United States Navy named for Coronado, California, a city adjacent to Naval Air Station North Island in San Diego. After World War II service in the U.S. Navy, she served in the Soviet Navy as EK-8 and later in the Japan Maritime Self-Defense Force as Sugi (PF-5) and Sugi (PF-285). USS Sandusky (PF-54), a Tacoma-class frigate in commission from 1944 to 1945, was the second United States Navy ship of the name and the first to be named for Sandusky, Ohio. She later served in the Soviet Navy as EK-7 and in the Japan Maritime Self-Defense Force as JDS Nire (PF-7), Nire (PF-287) and as YAC-19. USS San Pedro (PF-37), a Tacoma-class frigate in commission from 1943 to 1945, thus far has been the only ship of the United States Navy to be named for San Pedro, California. She later served in the Soviet Navy as EK-5 and in the Japan Maritime Self-Defense Force as Kaya (PF-8), Kaya (PF-288) and as YAC-23. The first USS Ogden (PF-39) was a Tacoma-class frigate in commission from 1943 to 1945. Originally classified as PG-137, she was the first ship of the United States Navy to be named for Ogden, Utah. She later served in the Soviet Navy as EK-10 and in the Japan Maritime Self-Defense Force as Kusu (PF-1), Kusu (PF-281), YAS-50 and YAC-22. The second USS Long Beach (PF-34) was a Tacoma-class frigate in commission from 1943 to 1945. She later served in the Soviet Navy as EK-2 and then in the Japan Maritime Self-Defense Force as Shii (PF-17) and Shii (PF-297) and YAS-44. 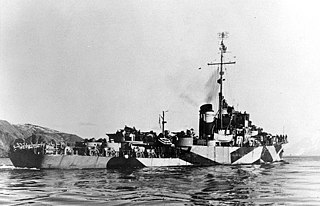 The second USS Gallup (PF-47), a Tacoma-class frigate in commission from 1944 to 1945 and from 1950 to 1951, was the first ship of the United States Navy to be named for Gallup, New Mexico. She also served in the Soviet Navy as EK-22 and in the Royal Thai Navy as HTMS Prasae. USS Belfast (PF-35), the only ship of the name, was a United States Navy Tacoma-class frigate in commission from 1943 to 1945. She then served in the Soviet Navy as EK-3. USS Rockford (PF-48), a Tacoma-class frigate in commission from 1944 to 1945, thus far has been the only ship of the United States Navy to be named for Rockford, Illinois. She later served in the Soviet Navy as EK-18 and in the Republic of Korea Navy as ROKS Apnokkang (62). USS Carson City (PF-50), a Tacoma-class frigate in commission from 1944 to 1945, thus far has been the only ship of the United States Navy to be named for Carson City, Nevada. She later served in the Soviet Navy as EK-20 and in the Japan Maritime Self-Defense Force as JDS Sakura (PF-10), JDS Sakura (PF-290) and as YAC-16. USS Augury (AM-149) was an Admirable-class minesweeper built for the United States Navy during World War II and in commission from 1943 to 1945. In 1945, she was transferred to the Soviet Navy, in which she served as T-334. USS Candid (AM-154) was an Admirable-class minesweeper built for the United States Navy during World War II and in commission from 1943 to 1945. In 1945, she was transferred to the Soviet Union and served after that in the Soviet Navy as T-283. USS Capable (AM-155) was an Admirable-class minesweeper built for the United States Navy during World War II. In 1945, she was transferred to the Soviet Union and then served in the Soviet Navy as T-339. USS Captivate (AM-156) was an Admirable-class minesweeper built for the United States Navy during World War II and in commission from 1943 to 1945. In 1945, she was transferred to the Soviet Union and then served in the Soviet Navy as T-338. USS Caution (AM-158) was an Admirable-class minesweeper built for the United States Navy during World War II and in commission from 1944 to 1945. In 1945, she was transferred to the Soviet Union and after that served in the Soviet Navy as T-284. USS Indicative (AM-250) was an Admirable-class minesweeper built for the United States Navy during World War II and in commission from 1944 to 1945. In 1945, she was transferred to the Soviet Union and served in the Soviet Navy as T-273. The Soviets converted her into a naval trawler in 1948 and renamed her Tsiklon. USS Palisade (AM-270) was an Admirable-class minesweeper built for the United States Navy during World War II and in commission from 1944 to 1945. In 1945 she was transferred to the Soviet Union and served in the Soviet Navy after that as T-279. The second USS Machias (PF-53) was a United States Navy Tacoma-class frigate in commission from 1944 to 1945 which later served in the Soviet Navy as EK-4 and the Japan Maritime Self-Defense Force as JDS Nara (PF-2), JDS Nara (PF-282) and YTE-8.